So….I have a rather spring-like bread for you today. 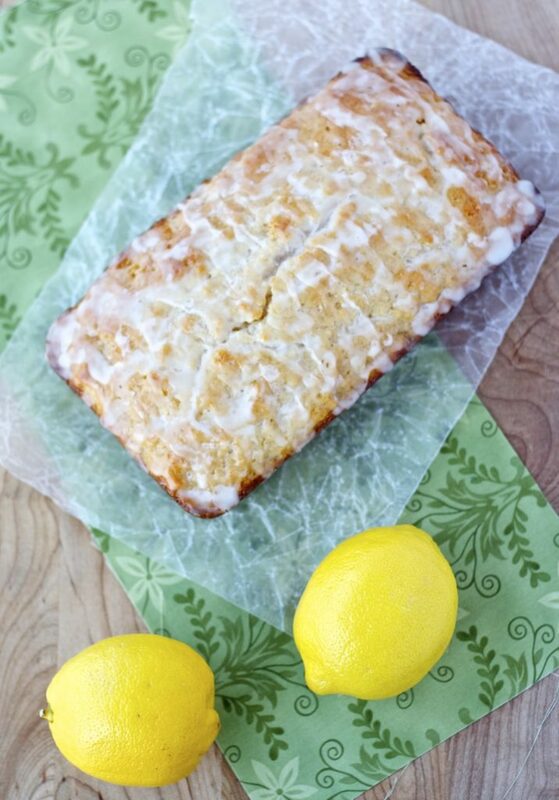 Lemon yogurt loaf with a lemon glaze. Now I know for some of you it is fully summer now. But where I live, May is still spring. We can finally plant flowers now, and go outside without coats. And we probably won’t get any more snow at this point! Although, to be honest, I wouldn’t bet against it. Unfortunately. One of the joys of living in a rather Northern location. It DID snow last week, after all. It’s gone now, and probably done for the year, but still. At any rate, I am still very much into spring like things filled with lemons when it comes to baking. Lemon in things always makes me think of spring. It’s just such a refreshing flavour that it feels like spring to me. And I really love lemon in all the things, so I’m holding onto spring like stuff in my baking for as long as possible! Plus, this lemon yogurt bread is quite healthy. It’s half whole wheat flour rather than all white, it’s quite low sugar with only half a cup for the whole loaf, plus it used coconut oil rather than butter, which is healthier and also complements the lemon flavour perfectly. It’s also full of plain Greek yogurt which I love adding to baked goods to add a little protein, plus it also adds a lot of moisture to the bread. 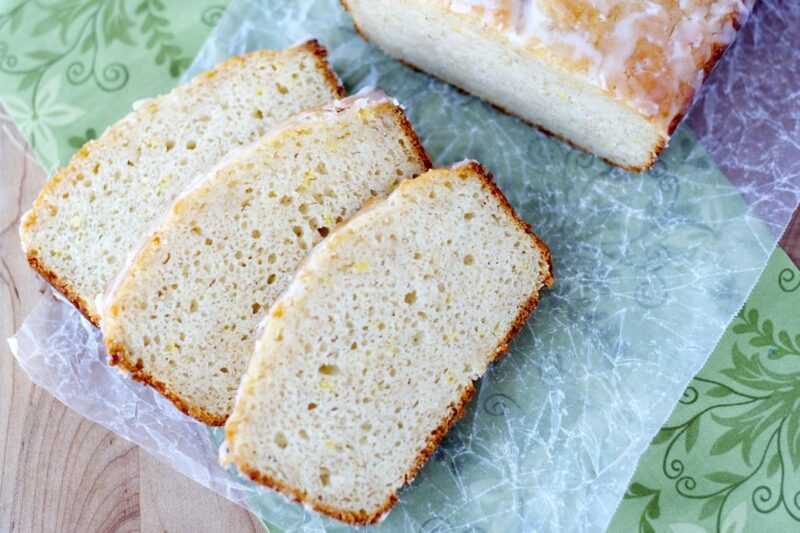 This lemon yogurt bread is actually so secretly healthy, that my mom kept calling it cake. It’s that good. You can’t go wrong with a bread that is healthy enough for breakfast, but tastes as good as cake. And, if you really want to up the health factor, you could easily skip the lemon glaze, it would be great without it. But…. don’t skip the glaze. It’s the perfect mix of tart and sweet, and really ups the lemon flavour in the bread. And a little glaze never hurt anyone, right? Enjoy! I also shared this lemon yogurt bread recipe over at Cupcakes and Kale Chips, so make sure to check it out over there too! Note: I could taste a hint of coconut in this bread from the coconut oil, which I think went quite well with the lemon, but if you don’t want that coconut taste, use canola or another vegetable oil instead of the coconut oil. In a large bowl, combine the granulated sugar and lemon zest, rubbing the zest into the sugar with your fingers until it is fragrant and a light yellow colour. Add the whole wheat flour, all-purpose flour, baking powder and salt and mix well. In a small bowl, whisk together the yogurt, eggs and vanilla. Slowly add the melted coconut oil, whisking to combine it with the other wet ingredients. Add the wet ingredients to the dry and stir until just combined. Pour the batter into the prepared loaf pan and smooth the top. Bake for 50-55 minutes until a toothpick inserted in the center comes out clean. Allow to cool in the pan for 5-10 minutes and then remove to a wire rack to cool completely. In a small bowl, whisk together the powdered sugar and lemon juice until smooth. Start with 2 tablespoons of lemon juice and add more as needed until it’s thin enough, up to 3 tablespoons. Spoon the lemon glaze over top of the cooled bread and allow to set. Store in an airtight container, or wrapped in plastic wrap for 3-4 days. Source: Adapted from Sweet Pea’s Kitchen . This is a really delicious loaf to enjoy with a cuppa tea! Who DOESN'T like lemon!!!! I'll be making this again, to share with my ladies Mahjong ladies group! What a perfect looking cake! LOVE the texture and lemons.. ?? wow!! I picture myself in my garden with a slice of this and a glass (read pitcher) of my white wine sangria and my favorite book!! Found you on FBC.. BTW I co host a link party with some other bloggers..Its called #SaucySaturdays and we would love for you to join us :) Do hop on to my blog and take a peek.. Thanks! Lovely pictures n all but I have tried everything to find the recipe..... feeling way frustrated. I don't think it should BE that hard. Hi Lia - I'm sorry you couldn't find it - the recipe is over at Cupcakes and Kale Chips where I'm a contributor, the link is below the final picture in the post, just click on the words "Cupcakes and Kale Chips". Let me know if you still have trouble, thanks! Looks so yummy and perfectly baked! I certainly will keep the glaze. Why leave it off right?! Thanks Rachel! This looks wonderful. I bet the yogurt makes this bread super moist and tender! I love breads like this! This looks so delicious, and I love that it is healthy! Well, this looks like summertime in bread form! And who could skip that delectable glaze? Glad to hear it! :) Thanks Andi! Love quick breads and this one looks amazing! And the glaze is the perfect addition to it! Pinned! This bread looks SO good Stacey! I love that you made it a little healthier and covered it with glaze...because that definitely does NOT hurt anyone ;) Heading over to get the recipe and pinning! Well, you COULD leave the glaze off if you want it really healthy right?! But why? :) Thanks Taylor! I love yogurt in baked goods! It creates a nice texture and adds a more complex flavor profile. Yogurt is so great in baking, I love using it! Thanks Cali! Looks so good! I'm glad it's warming up for you. I heard that with global warming, Canada's air mass is slowly moving south toward the US. Oh no! Lemon bread is a favorite of mine. And great glaze! Hahaha, maybe that's true because I swear our winters are not as cold now as they were when I was a kid. I love lemon bread too - thanks Mir! Lemon desserts are my absolute favorite! Love that it's lighter, it looks amazing! This looks gorgeous! Happy spring! I love lemon breads and cakes and the addition of yogurt makes them so moist. Such pretty pictures - Pinned! I love putting yogurt in baked goods, so good! Thanks so much Joanie! May is absolutely still spring around here as well! 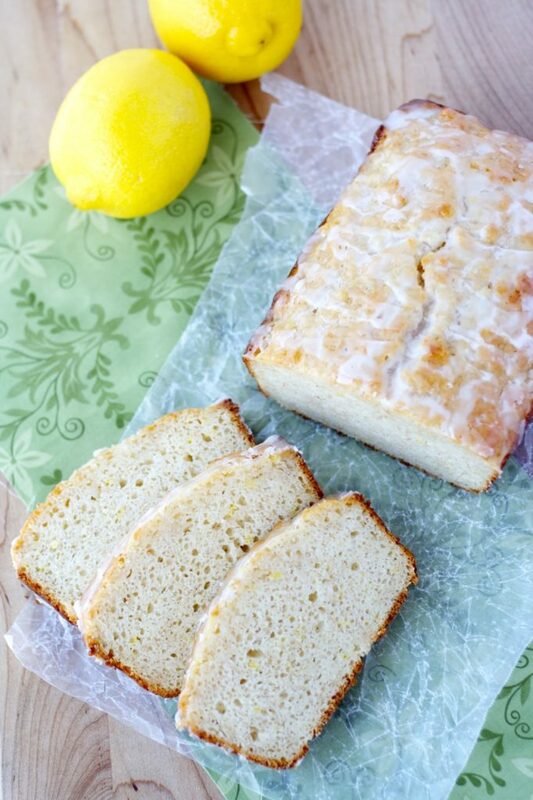 I love the look and sound of this lemon yogurt bread - being healthier makes it even better! I know - it's great when you can have something treat-like for breakfast and not even feel guilty about it! :) Thanks Nora! Lemon loaf is my favorite! This bread looks amazing! Half a cup of sugar for the whole loaf is really good!! You've convinced me! I recently made lemon cookies and I already miss the fresh citrusy flavor! Love how dense and delicious this bread looks! Yay is right, it's time for warmer weather! Thanks Cyndi! 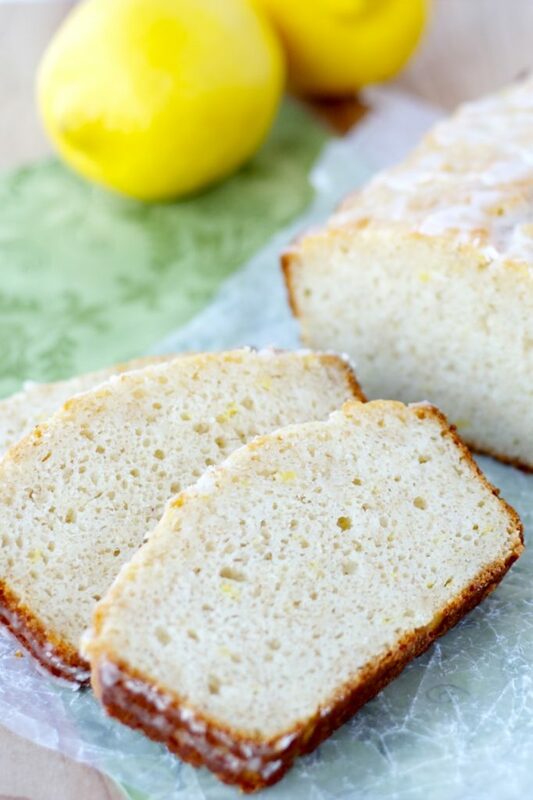 love lemon breads, this looks gorgeous Stacey!! Aren't they just so good?! Thanks Manali! I am seriously OBSESSED with quick breads like this. OMG love that lemon, yogurtness! Heading over to get the recipe now! This bread looks gorgeous, Stacey! I love sneaking in yogurt to baked goods, so this sounds just perfect. And lemon is definitely perfect for the spring! I'm constantly throwing yogurt in everything I bake, I love it! Thanks Gayle! I love lemon and carbs! And Spring.... though it's pretty chilly here right now! Definitely heading over for the recipe. Pinned! Thanks Ashley! It was actually pretty warm here today, I got to plant my flowers so it's feeling close to summer now! Yay! Oh this bread looks delicious! I feel like I finally really appreciate lemon in baked goods! It's kind of back and forth between spring and summer by us - it'll be 90 one day and then only like 60 a few days later! This bread looks so light and fresh. Love that it's healthy!